Quill Q800 Spiral Notebook Side Opening 400pg 102x140 - Quill Spiral range, Hard wearing Polypropylene covers, Quality paper throughout - FSC certification in train. Quill Q563 Spiral Notebook Top Opening 100pg 200x127. Hard wearing Polypropylene covers, Quality paper throughout - FSC certification in train. Quill Q570 2 Subject A5 Spiral 200pg Side Opening. Hard Wearing Polypropylene covers, Quality paper throughout - FSC certification in train. Quill Q592 120pg 222x179 Spiral Notebook Side Opening. Hard wearing Polypropylene covers, Quality paper throughout - FSC certification in train. Quill Q593 120pg 252x200 Spiral Notebook Side Opening. Hard Wearing Polypropylene covers, Quality paper throughout - FSC certification in train. A4 Quill Q595 120pg Spiral Notebook Side Opening. 7mm ruled notebook- Quality polypropylene cover- Hard wearing- Economy pricing - FSC certification in train. 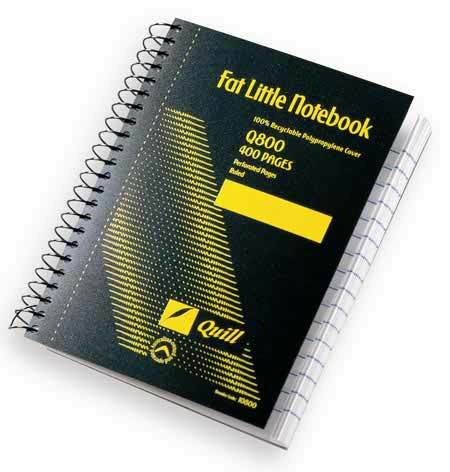 Quill Q906 A4 7 Hole Spiral Notebook 140pg Side Opening. Hard Wearing Polypropylene Covers - Quality paper throughout - FSC certification in train. 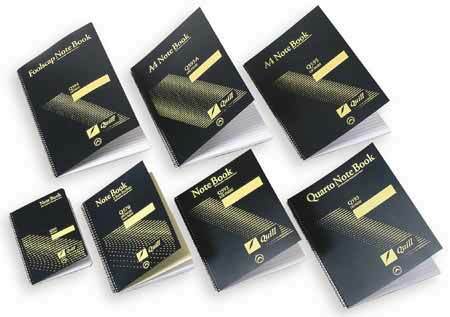 Quill Q906A A4 7 Hole Spiral Notebook 250pg Side Opening. Hard Wearing Polypropylene Covers,Quality paper throughout - FSC certification in train. Quill Q596 A4 250pg 5 Subject Notebook Side Opening. Hard wearing polypropylene covers, Quality paper throughout - FSC certification in train. 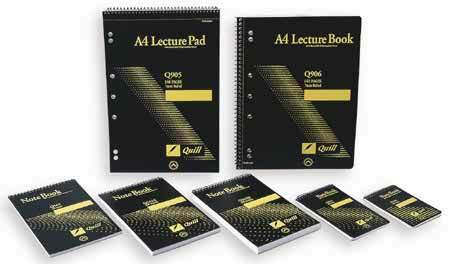 Quill Q599 A4 300pg 3 Subject Notebook. Hard Wearing Polypropylene covers, Quality paper throughout - FSC certification in train. 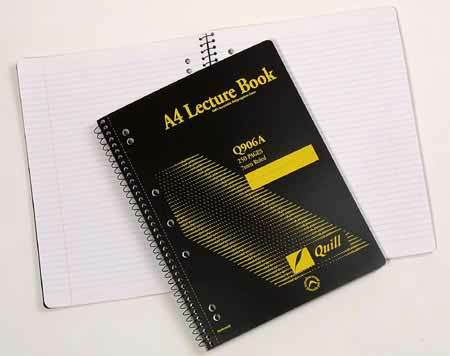 Quill Q 600 A4 1 Subject Spiral Notebook. Hard wearing Polypropylene covers - quality paper throughout - FSC certification in train. A4 Lecture Pads Olympic - 70 leaf - Economically priced, Ideal for use in - 2, 3, and 4 Ring Binders. 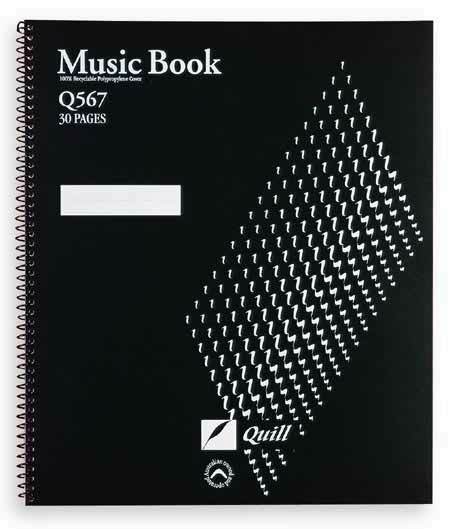 Quill Q567 Music Book 12 Stave 297mm x 248mm - 30page - Hard wearing polypropylene covers, Quality paper throughout - FSC certification in train. Quill Q568 Music Book 152mm x 248mm - 6 Stave - 36 page - Hard wearing polypropylene covers, Quality paper throughout - FSC certification in train. Quill Q569 Music Book 6 Stave & Feint Ruled - 36 page - Hard wearing polypropylene covers, Quality paper throughout - FSC certification in train.